Banjoiste Bluegrass US né le 4 Novembre 1946 à Norman (Oklahoma). Alan Munde a été membre des Poor Richard's Almanac, Stone Mountain Boys, Bluegrass Gazette, Flying Burrito Brothers et des Sunny Mountain Boys. 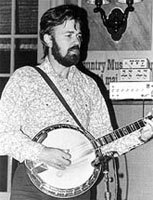 Alan Munde was an Oklahoman banjoist who first emerged in 1969 as a player with bluegrass guitarist Jimmy Martin's band. Munde remained with Martin until 1971, when he left to join Country Gazette with Roger Bush (bass), Kenny Wertz (guitar), and Byron Berline (fiddle). The combo released Traitor in Our Midst in 1972 through United Artists. Munde would remain the constant in Country Gazette over the next 20 or so years, even as its membership fluctuated around him. But he also found time to release solo albums and collaborate with like-minded modern bluegrass musicians like Sam Bush and Joe Carr, with whom he released 1996's Windy Days and Dusty Skies. Munde also released a series of how-to and transcription books through AcuTab that detailed his banjo style. 10/2008 CD MUNDE'S CHILD MCR-003 (US) MADE TO LAST - ALAN MUNDE GAZETTE - Wave Goodbye / Fool's Gold / Traditional Family Breakdown / Made To Last / Little Teardrops / Brown County Breakdown / Above The Waterline / John Hardy / Penthouse To Poorhouse / The Run Of '89 / Haul Away / What's So Good About Goodbye?